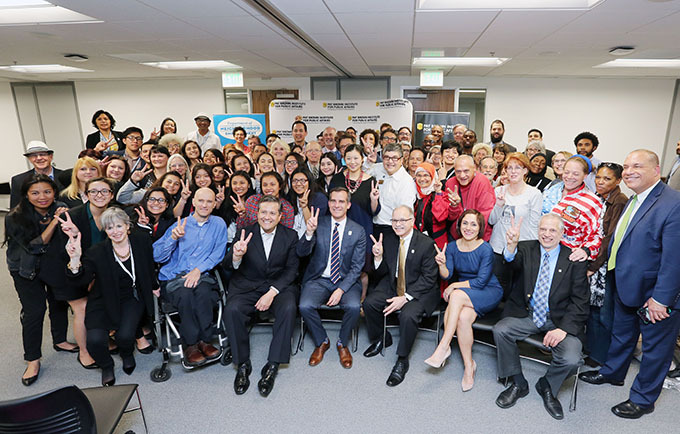 LOS ANGELES, CA, February 26, 2016 - Los Angeles Mayor Eric Garcetti paid a visit to Cal State LA's Civic University, where he wished the graduating class well as they return to their communities with new skills to become more engaged. Civic University 2.0 is s a non-credit certificate program covering the processes and the important functions of Los Angeles city government. Offered by the College of Professional and Global Education, in partnership with the Pat Brown Institute at Cal State LA and the Mayor's Office, Civic University arose from a realization that there are immense gaps in public knowledge and understanding of how Los Angeles city government works. The training was held at Cal State LA's new downtown campus at 801 S. Grand Avenue, which opened in January. Garcetti was welcomed at the February 23 session by President William A. Covino and Raphael Sonenshein, executive director of the Pat Brown Institute. The four sessions were attended by about 100 people, including approximately 80 board members of the Los Angeles neighborhood councils and 20 members of the Mayor’s Youth Advisory group. Civic University featured speakers including Los Angeles Chief Administrative Officer Miguel Santana, Los Angeles Councilmember Marqueece Harris-Dawson, and Lilian Coral, the mayor’s interim data officer. At the final session, President Covino served with Santana and Ana Guerrero, the mayor’s chief of staff, on a review panel for group project presentations. “It was inspiring to see neighborhood leaders and youth working in teams to devise and present sophisticated proposals for community change to a panel of top officials,” Sonenshein said. “This is informed democracy in action." Cal State LA is a university dedicated to engagement, service, and the public good. Founded in 1947, the University serves more than 27,000 students and 240,000 distinguished alumni, who are as diverse as the city we serve. Located in the heart of Los Angeles, Cal State LA has long been recognized as an engine of economic and social mobility. Led by an award-winning faculty, the University offers nationally recognized programs in science, the arts, business, criminal justice, engineering, nursing, education and the humanities.